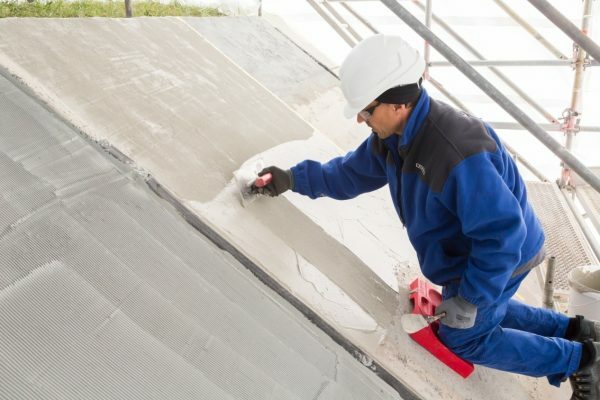 WACKER, the Munich-based chemical company, debuted a high-performance sealants and adhesives for the construction industry alongside polymer binders for waterproofing membranes and cementitious tile adhesives at INTERBUILD AFRICA2018. One of the booth highlights was VINNAPAS®760ED, a water-repellent dispersion that can be used to manufacture flexible two-component waterproofing membranes. WACKER also presented VINNAPAS®8118 E, a polymer powder for formulating cementitious tile adhesives that meet C1 and C2standards (EN12004). WACKER Silicones showcased a general purpose acetoxy silicone sealant for industrial and do-it-yourself applications along with a water- based acrylic sealan suitable for building repair. INTERBUILD AFRICA took placefromAugust 15 to 18 in Johannesburg, SouthAfrica. year has helped our customers test applications in real-time and to engage with our technical expertsdirectly. VINNAPAS®760 ED is a terpolymer based on vinyl acetate, ethylene and vinyl ester that can be used as a hydrophobic binder in two- component waterproofing membranes such VINNAPAS®760 ED ensures outstanding crack bridging, even at exceptionally low temperatures down to -20°C. Additionally, it is highl yresistant to hydrostatic pressure. Sealing systems base don VINNAPddddddAS®760 ED thusachieve crack-bridgingclass O2 as per EN 14891. Thankstothe new dispersion, the end productbondsreliably and permanently to difficult substrates. VINNAPAS®760 ED dispersion is ideal for the formulationof the two-component sealing slurries used, forexample, to waterproo findo orpoolsandbathrooms as well as waterpipesand sewers. At INTERBUILD, WACKER presented VINNAPAS®8118E,a terpolymerpowder forcementitioustile adhesivesbased onavinyl acetate-vinyl chloride-ethylene technology. Technical mortars modified with theproduct meetC1and C2standards(according to EN 12004), which means that theyfulfill advanced requirementswith respecttoextendedflexibilityand waterresistance.VINNAPAS® 8118 E combines a long open time with increased bonds trength after water immersion and heat aging. WACKER also showcased selected sealants for construction applications for the very first time in South Africa. WACKER®WN is a one-component, neutral-curesilicone for weatherproof applications. VINNAPAS®8118 E covers a broadspectrum of tile adhesives. It is equally recommended for C1 adhesives with good performance after heat storage and for C2 adhesives with high water resistance. It also offers perfect transversalde formation fo rS1 and S2 tile adhesives. It is designed for interior as well as for exterior sealin gapplications. When used as an exterior sealant, it offers excellent weather ability, gun ability and durability on alkaline substrates such as concrete and mortar. Interior applications include these aling of curtain walls, aluminum panels and joints (enameledand otherwise). It can be applied between various substrates to form glass-glass, glass- concrete and aluminum-concrete seals, among others. WACKER also presented silicone applications such asWACKER® GP and WACKER®PS.WACKER®GP is a general purpose acetoxy silicone sealant. It adheres to glass,tiles, ceramics and enamel as well as to impregnated, varnished or painted wood and selected plastics. WACKER®PSisa water-based acrylic sealan suitable for building repair and for internal and external cracks exposed to little or no movement.The sealant is paintable.